They have been overlooked by the international media, whose gaze has been fixed on Tahrir Square in Cairo and Taksim Square in Istanbul. 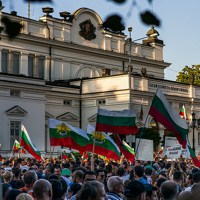 But Bulgaria’s ongoing anti-government protests, which entered their 50th day last week, are indicative of a broader disillusionment with the political and economic elite seen all over Southeastern Europe. The concept of a state “captured” by business interests may resonate well beyond Bulgaria’s borders. The question is whether real change to how politics and the economy are run will come about.